"It's been a good ride for sure and to be a part of Team Penske is everything I ever dreamed of and more," Keselowski said. Brad Keselowski quickly realized he blew the restart that allowed Erik Jones to take the lead. His determination to overcome the mistake and a strong Ford Mustang made for the perfect mix to reclaim it with laps to spare, leading to a milestone victory. Keselowski overtook Jones with eight laps remaining and held him off to win the NASCAR Xfinity Series race Friday night at Kentucky Speedway. That gave Team Penske its 50th series victory, while the driver moved into fifth place all-time with 33 wins. "It's been a good ride for sure and to be a part of Team Penske is everything I ever dreamed of and more," said Keselowski, who earned a jukebox with his third Kentucky victory that tied teammate Joey Logano (2008-10). He had to bounce back from a mental hiccup after a Lap 169 restart that appeared to hand the race to Jones. Unfazed, the 2010 Xfinity Series champion regrouped and guided his No. 22 Ford Mustang past Jones' Toyota on Lap 192 and went on to the win after finishing second last year. "We went back and forth there for a minute with (Keselowski)," Jones said. "Unfortunately, a lapped car slowed us down enough for him to get by." It was just the break Keselowski needed. "Maybe I built up a little bit of a false sense of confidence," Keselowski said, "because when Erik got by me on that last restart I thought, 'Oh, we'll get right back by him.' It was not easy." 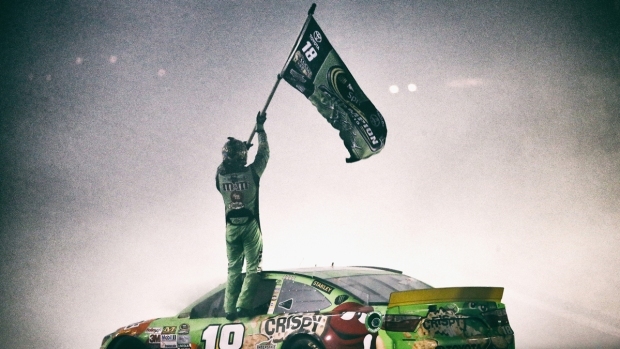 Kyle Busch (Toyota) was third after leading three times for a race-high 88 laps, with rookie Daniel Suarez (Toyota) fourth and veteran Elliott Sadler (Ford) fifth. Chris Buescher remained atop the standings and has a 36-point lead on defending series champion Chase Elliott after finishing 11th, two spots ahead of Elliott. Keselowski led three times for 72 laps for his 27th series win with Penske. He will start second in Saturday night's 400-mile Cup race that he's won twice. Keselowski started fourth but was in the hunt and soon established himself as another contender when he overtook Busch on Lap 79 and set the pace from there. He eventually yielded the lead upon pitting to Darrell Wallace Jr., who led briefly before giving the lead back to Busch as he pitted for tires and fuel to prepare for the stretch run. Keselowski was soon stalking Busch and caught a break on Lap 163 when John Wes Townley hit the Turn 2 wall to bring out a caution and send the leaders down pit road. Keselowski took two tires and beat Busch out of the pits. He led the restart before allowing Jones to surge ahead for 22 laps. "I was able to hang with him just enough to pressure him and he got in a bad spot with a lapped car," Keselowski said. "When it happened I was able to just jump all over him."